Disclosure: I received an AUKEY PA-S9 Power Strip for review purposes. All opinions are my own. You are going away on a family vacation. You get to your destination, check into he hotel, go to your room, put your bags down, and then go to plug in your phone. But there are less outlets than you have devices. What a predicament! The other part of this picture are the amount of charging blocks you need to carry with you, to properly charge all of your devices. In our family, that is 4 phones, 4 charging cases, 2 iPods, and 2 iPads. 12 devices minimum. It’s one thing to carry enough charging cables, but having to rotate the charging of the devices can become a chore in itself. This is exactly what happens when we go away. When AUKEY Canada reached out to me to see if I would like to review their PA-S9 Power Strip, I gladly accepted. 8 power outlets and 6 USB ports had me intrigued. • Fully equipped. Comes with a 5 foot cable, bottom mounting ports, and on/off switch. The AUKEY PA-S9 Power Strip is equipped with 8 power outlets and 6 USB ports. It is a perfect addition to any office, workstation, kitchen, or bedroom. You can power everything on or off at once. The AUKEY Green AiPower USB ports on the power strip are engineered to provide a safe maximum recharge rate for any USB powered device, up to 2.4A per port. There are built in safeguards and advanced circuitry to protect your devices from excessive current, overheating, and over charging. 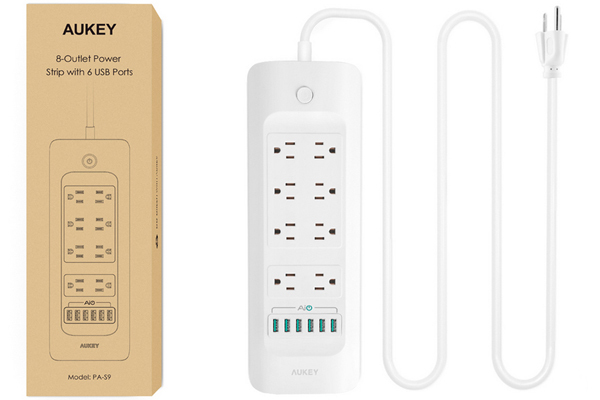 Like all of their products, AUKEY backs the PA-S9 Power Strip with a 24-month warranty. This power strip helped keep all of our devices charged on our last mini getaway. We were able to charge them simultaneously, thanks to the 6 USB ports, and the 8 outlets. We used power blocks in the outlets to keep the other devices charged. The AUKEY PA-S9 Power Strip will now accompany us on all of our vacations, getaways, and trips in the #SilvaBulletRV. Visit AUKEY’s website to read more about the PA-S9, and all of the other fun gadgets they have. You can also follow them on Instagram, Twitter and Facebook. I would need to keep several things charged; phone, laptop, bipap and camera. I could keep my two phones and my laptop charged. I never travel alone so anyone who is with me would be able to stay charged as well. We would need to keep our 2 cell phones, Tablet and 2 laptops, charged while traveling. I need to keep my laptop, Ipad and phone charges and hubby has his Ipad too. I would need to keep my tablet and or laptop charged! My cell, iPad, camera, Kobo plus my fitbit! I would need to keep my tablet charge when travelling! I would need to keep my cell phone, my iPad, and my digital camera charged while traveling. I would need my phone, hubby’s phone and our tablets charged! I would need my phone, camera, and tablet charged while traveling. I would need to charge my phone, ipad, camera and fitbit. With this AUKEY PA-S9 Power Strip I’ll be able to charge 4 phones, a couple tablets, a couple of laptops and sleep peacefully because there is no fighting over the plugs. Great give away. I would need to keep phones, a tablet, laptop, rechargeable camera batteries, and my hubby would need to keep his Polar Fitness tracker charged while on vacation. I would need to charge my phone, laptop, tablet, camera and any devices the kids needs, which are usually some handheld gaming device and tablets. My camera for sure, 2 phones and a couple of tablets for our family when we travel. Would have to keep the iPad charged for the kids can watch movies in the car. between hubby and myself we would have, two phones, two tablets, one kobo, two cameras and one fitbit! This would be excellent for charging all my devices beside the bed or couch! I need to keep my phone charged at all time especially when I am travelling. I need to keep my phone charged and my GPS when traveling. We have a ton of electronics that need charging and either can’t find a charger or the charger is broken. This would help solve these problems! I like to keep my phone, ipod and e-reader charged! If I owned a camera that would definitely need to be kept charged! My Apple watch, iPhone and computer! So so much eek! When travelling I would need to charge my phone and my husband’s and also my camera and my samsung galaxy tablet.This is just awesome for charging things up at any time! While travelling, I have to keep my camera and iPhone charged. I actually keep extra chargers in the car so we will have a way to charge them in case our chargers are ever forgotten in a hotel room. Thanks for the super giveaway opportunity! I like to keep my iphone, ipod and ereader charged when I travel. With a 6-year-old we definitely need to keep the ipad charged! Cameras, cell phones and tablets! I use the GPS on my phone when travelling so I need to keep it charged! Our phones and ipad need charging when travelling. We need to charge so many tablets, phones and my laptop. There’s never enough plugs! My phone is the most important thing I like to keep charged! Have to keep tablets, cell phones & laptop charged when travelling. I need to keep my phone, tablet and camera charged. I need, while travelling, to keep charged, 2 laptops, 2 phones and my Kindle Fire. Could my previous comment please be deleted. I would charge my phone and tablet. We have alot of devices to keep charged with six of us! There are two phones, three iPods and a tablet! I need to keep my fitbit charged so that I get my daily steps in! I would charge my GPS, phone, laptop and DVD player when travelling. The devices I would need to keep charged while travelling are our cellphones as well as the tablet. Definitely need to keep my phone and laptop charged. I would need my phones, tablet and camera charged at all times! Phone, tablet, Kobo and my fitbit! OMG my phone, my kid’s phone, my kid’s portable dvd player. on our last vacation we could not keep our cell charged! My cell phone and tablet. We like to bring our cellphones, cameras and laptops when we travel. Being able to easily keep them all charged no matter where we go is important!! Cell phone is essential to keep charged while travelling. many devices come along like a cell, a smart watch and a tablet. I would use this for our cell phones. Have to make sure the kids tablets are charged or look out!! I need to charge 2 phones, my kindle, my camera battery and tablet. I need to keep my phone charged when travelling . cell phone, iPad, camera, fitbit and my Kobo! The devices I would need to keep charged while travelling are my watch, cell and tablet. my camera, kindle and phone. I would use this power bar to connect my tv, PS4, Android Box, internet plug ins, etc! What a sweet powering tool! I liek to keep my Iphone, ipod and Kobo charged when I am traveling! While travelling I need to plug in 2 tablets, my kindle and 2 phones. While on vacation we charge a cell, tablet and watch. I’m getting ready to head to my mom’s with my 2 kids. We are taking our electronics for quick downtime at gramma’s when gramma and I are making dinner. We’ll need to be able to charge our phones and tablets. I need my phone and iPod charged while I travel! I need to keep my phone charged while travelling. I need t keep my tablet charged while travelling. While on vacation the tablet would need to remain charged. our tablet and cell need to be charged. I would want to keep my small laptop charged while travelling. we would need to ensure the watch, the tablet and the phone were charged while travelling. We always need to charge our phones on vacation. Got to keep the phones charged!! on vacation we require our cell and tablet to be charged. I need to charge my tablet while on vacation. We always need to keep our phones charged while on vacation. I would want to keep my laptop charged while travelling. I need to keep my phone charged in case of emergencies! I need to keep my iPhone and tablet charged. Definitely need to keep my cell phone charged while travelling. We need to keep our phones and tablets charged while travelling. we have a new smartwatch which would come with us and need charging. We need our phones and Garmin charged. I need to charge my tablet while travelling.